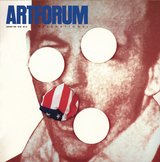 Greil Marcus is a contributing editor of Artforum. His essay “The Masked Marauders” is collected in The Penguin Book of Rock & Roll Writing, recently published by Viking. Order the PRINT EDITION of the January 1993 issue for $17 or the ONLINE EDITION for $5.99.